It requires a lot of patience to find the perfect end tables for a room. These tables are part of your overall room design and you should follow some general guidelines to make sure they don't distract from your focal point or create too much conflict with everything else that is going on in the room. It's a delicate balance between your personal preferences and basic standards of design. Do end tables have to match the coffee table? NO! Having three tables in a space all matching sounds like a recipe for boredom in my opinion. I know it's easy when you buy a set and I know many homeowners opt for this solution, but I like a more curated look where each piece has obviously been given careful consideration and chosen for the space. It is important that the pieces harmonize in the space or provide an impact whichever you are going for. In this room the end tables match each other and are light and airy which is in opposition to the coffee table which is upholstered and dark. While they don't match the whole room is harmonized. 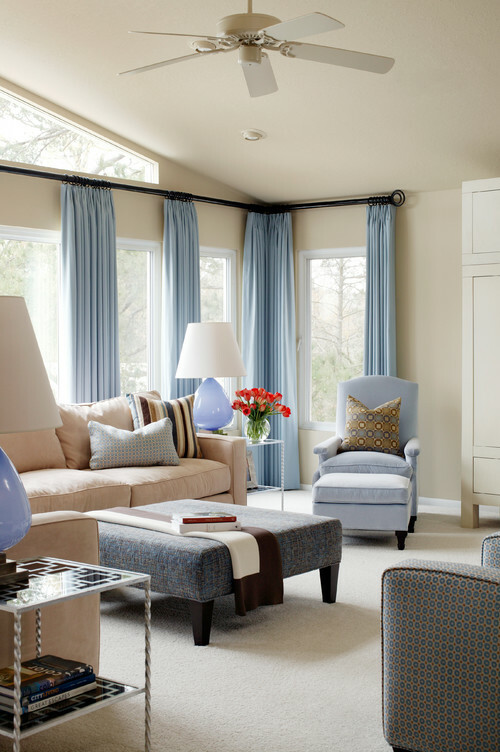 This is another living room design by Tobi Fairley which has matching end tables with a very different coffee table. I would argue that the end tables, while very interesting in the overall design scheme, are too high. I could see more than one elbow smacked on these! That leads to the second consideration. What's the perfect height for end tables? By function an end table is usually placed by a chair or sofa and you have to lift your arm over the arm of the furniture to lay something on the table. Remember function first. They also need to be tall enough to provide a base for a lamp which should be a reasonable height to shed light. 24 - 26" is the usual the height of an end table (some are as tall as 30in. ), but the chosen table should work with the proportions of your other furniture. A simpler way to say this is have your tables just below the height of the arm of the sofa/chair. But these are guidelines. The round table in the room below is taller than the chair but doesn't look out of proportion with the other furniture. There are also four different types of tables in this room and it doesn't look disjointed because they are all in the same wood tones. When you have this many tables, a mix of shapes is imperative. Some should be round to play against all the rectangles. While this is a lovely room, I personally find the end table too low for the high arm on the sofa. You would have to reach way up and then down to place a drink on the table. The lamp is also overpowering the table. Tables and lamps have to work together, but that's a topic for another post. Strictly speaking this is a side table, but the same principles apply to its selection. These nesting tables work beautifully with the lines of the chair. I like the use of the floor lamp with this vignette rather than having an overpowering lamp on these delicate tables.Threes always make interesting pairings. How do you choose a style/shape/colour? 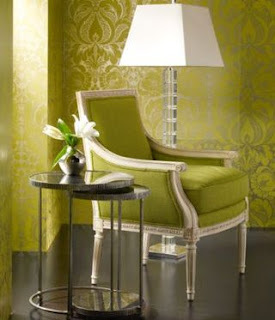 Your end tables can match the style of your other furniture or they can make a statement by having a dissimilar style. There are many ways to go when choosing shape. A square shape is a good connecting piece when you have sofas or sofa and chair at right angles to each other. It fits into the shape well and creates continuous flow. Some may find it too continuous and seek out a round shape to soften the look. 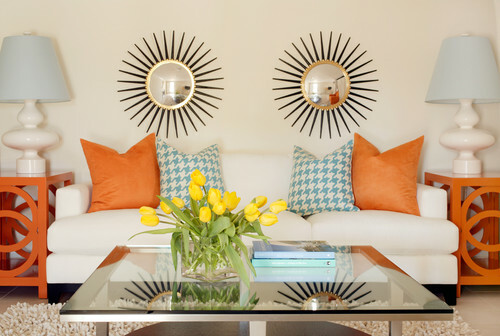 If you have soft furniture with rounded lines, a table with clean, straight lines adds variety to the look. The colour should be different enough so that it stands out from the floor colour. If you don't plan to invest in an area rug on hardwood floors, choose tables that are lighter or darker than your wood floors. This is one of the biggest mistakes homeowners make when choosing tables of any kind. I call it the disappearing furniture syndrome. Stumbled upon your blog...looking for tips on how to use screens in Interiors. 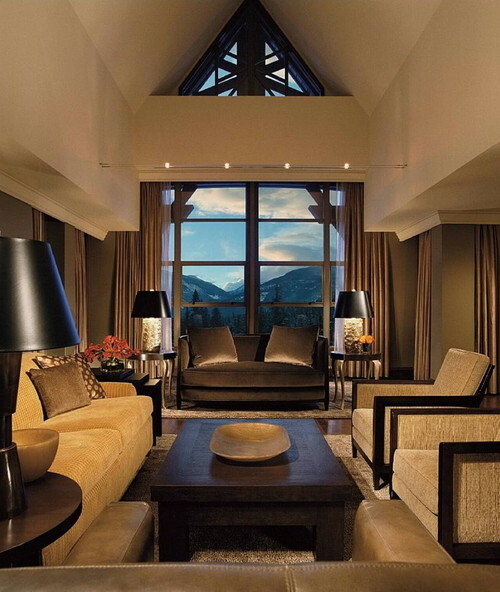 Great room by Tobi Fairley. Love the color palette in the Domicile room too. Do agree the couch and side table are mismatched though, although the lamp is quite charming. 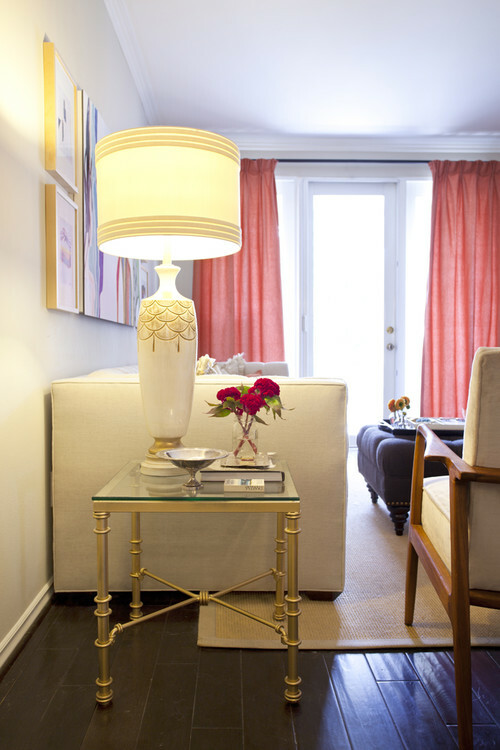 End tables are often one of those pieces that can be quite exciting to decorate and design. Good post. Conectează-te pentru a raporta conținut inadecvat.